There is no clear distinction between rivers and streams. In general, rivers are larger watercourses that are often too large or deep to wade across. 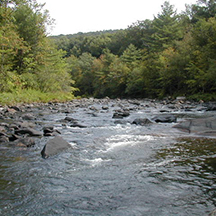 Rivers are often major migration pathways for migratory fish such as Atlantic salmon, American eel, lampreys, shad, and other species of river herring. They are also ecosystems that are vulnerable to ecological changes due to flooding and scour if there are more frequent and severe storms in our future due to climate change.